Listing for $2,810, only 151 Meteor Rideau Crown Victorias were built in 1955. It was announced to the press that the new Meteor line would be shown to the public on November 10, 1954. The 1954 model run wound down on October 7. It was time to change over and get the newest crop of Meteors rolling out the factory doors. Dealers were itching for them. Rumours ran rampant throughout the industry that 1955 was going to be the best year yet. Unfortunately, labour negotiations between the union and Ford were not going well. Demands for a 30-cent-an-hour wage hike and other accrued benefits fell on deaf ears. Workers in Windsor laid down their tools on October 10 in a strike action. Five days later, 1,150 workers in Oakville followed suit and joined their 5,200 union brothers in Windsor. Office workers in Windsor were laid off on November 5 and the strike spread to the parts depot in Etobicoke, Ontario when 125 employees walked on November 15. 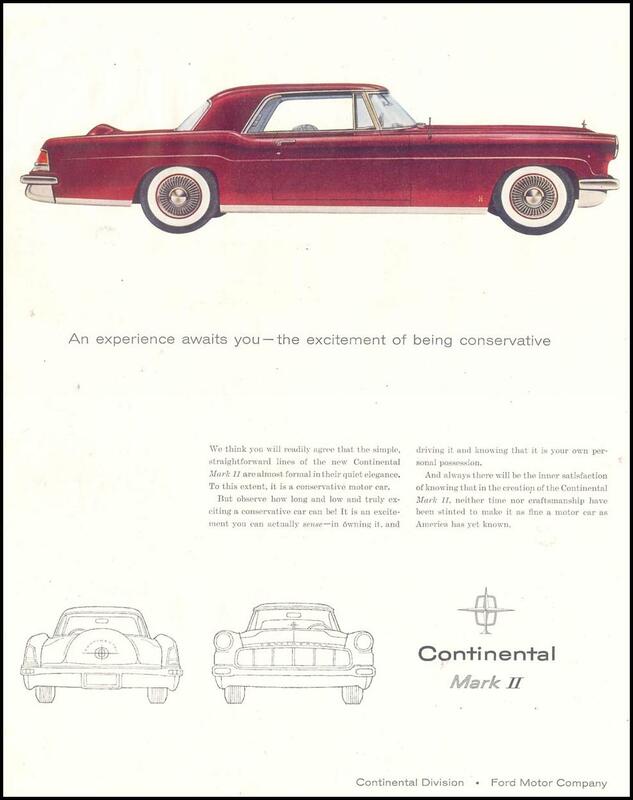 The Lincoln Contiental Mark II was built in Wixham, Michigan. Dealers would have little to sell; all 968 Ford-Monarch and Mercury-Lincoln-Meteor showrooms were going to be pretty empty until vehicles started rolling through the pipeline once again. Imported models like Anglias, Prefects, Consuls, Zephyrs, Zodiacs, Lincolns, Thunderbirds, Ford’s Crown Victoria hardtops and Country Squire station wagons would trickle in from abroad but they weren’t the bread-and-butter cars that generated sales. It was a grim Christmas for all the dealers in Ford of Canada’s kingdom. Ironically, in December, the company stock hit its high for the year, reaching $104 a share. When the 110-day strike was finally over in January of 1955, domestic production got under way. 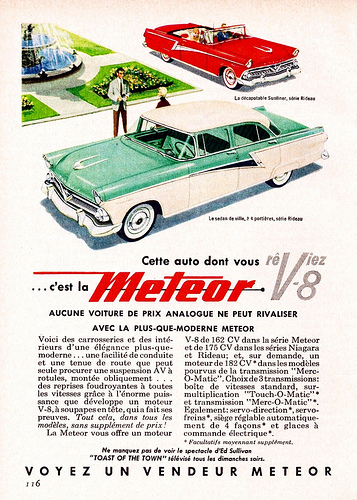 The first Meteors rolled out the doors of the Oakville plant on February 10, 1955. Dealers could heave a sigh of relief. It was a short-lived sigh because Ford officials announced substantial price changes on February 15. The price of base Meteor models rose from $68 to $79-more than a week’s wages for the average man. Niagara models jumped from $36 up to as high as $103. The Rideau line now cost $54 to $71 more than it did yesterday. 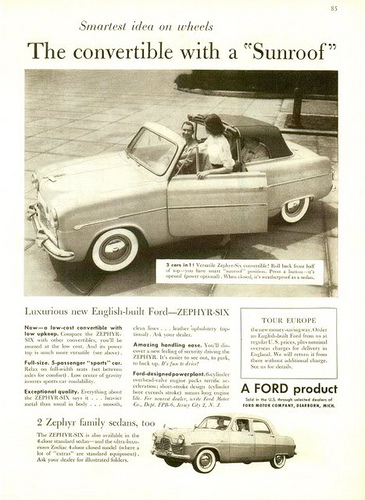 Oddly enough, the price on the Ranch wagon was cut by $2 and the ragtop’s price was lowered by $52. Selling for $2,935, The Meteor Niagara Country Sedan found favour with 349 buyers in 1955. All Meteors carried a narrow, concave, vertically ribbed grille was sliced neatly in half at the centre by a giant chrome “V” in which a gold Meteor star was ensconced. Large bullet-shaped turn signals housed in massive chrome bezels flanked the grille. Headlights sat deep within stylish visors with simulated air intakes stamped and painted into the bezels. A highly stylized flight form ornament graced the hood. From the sides, wheel wells were accented with heavy body creases and another crease ran across much of the rear quarter panel to the Jet-Tube rear lights that could hold optional back-up lights in their inquisitive fins. The greenhouse was improved. The Full-Scope Windshield was a full 33.2 centimetres (13 inches) wider than before and wrapped into the doors for “panoramic visibility.” The rear bumper had “METEOR” stamped into it and the deck lid repeated the star-within-the-“V” theme seen on the grille. 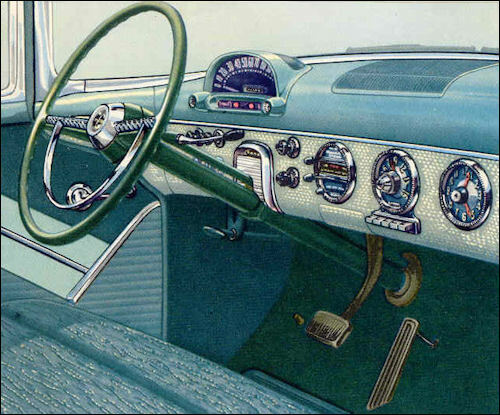 The Meteor shared its instrument panel with Ford and featured the see-though Astra-Dial instrument cluster in 1955. 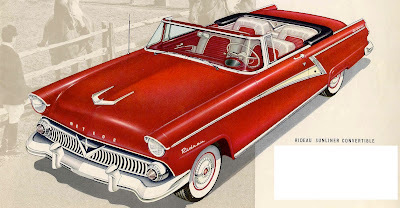 Meteor’s famed Wonder Ride was hyped as now being better than ever and the Rideau Crown Victoria promised to roll “majestically over the royal road with style, performance and quality.” It came in two-tone and tri-tone colour schemes, a special block pattern pleat in the seats. The steering wheel and column were offered in a range of colours to harmonize with the interior trim and the all-new Astra-dial instrument panel. The Crown Victoria shared top billing with the Rideau Victoria hardtop coupe, the Sunliner convertible, the Two-door Club Sedan and the posh four-door Town Sedan. A total of 661 units of the 1955 Meteor Rideau Two-Door Sedan was built. It sold for $2,461. Downstream from the Rideau clan was the Niagara family. It featured two and four-door sedans and a pair of station wagons. The more expensive Country Sedan carried eight passengers while the Niagara Ranch Wagon could haul six. The 1955 Meteor four-door sedan. Anchored just a tad further down the river was the base Meteor series. Meteor’s bargain basement lineup embraced a no-nonsense Four-door Sedan, a Two-door Sedan, a Business Coupe and a rugged Ranch Wagon. The 1955 Meteor Ranch Wagon was an honest day labourer. 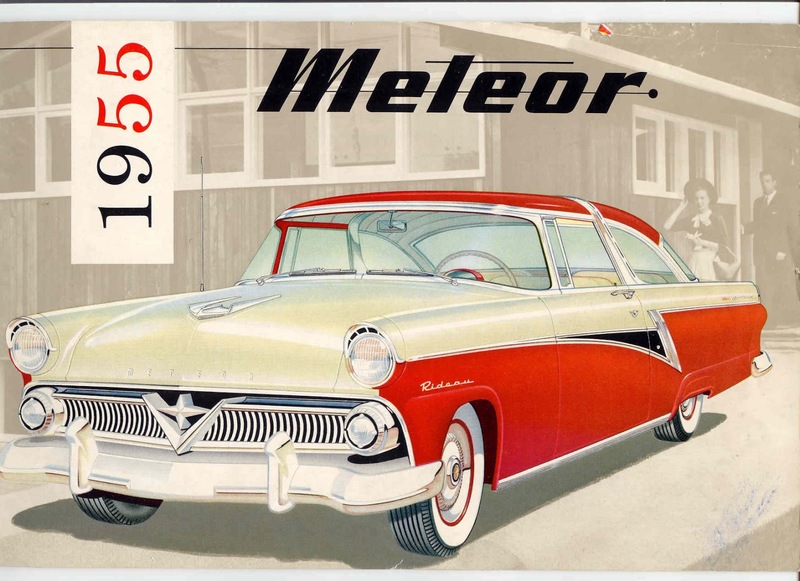 Meteor now shared its overhead valve V-8 engine with Ford, not Mercury. The 4.5-litre (272-cubic inch) mill was new to Canadians this year. Meteor owners could choose either the 175 or the 162-horsepowered versions, the more powerful engine was standard on the Rideau and Niagara series. Even the base motor promised to deliver 11 percent greater acceleration in every driving situation. The high compression engine was just part of the 1955 Meteor’s Trigger-Torque power train. Merc-O-Matic, Touch-O-Matic Overdrive or Silent-Ease Standard Transmissions sent all that power torquing to the rear wheels in 7/100ths of a second. The second most popular Meteor was the Niagara Two-Door Sedan. It found 3,942 buyers who shelled out $2,306 in order to drive one home. Niagara’s interior was touted as being “invitingly restful and unusually beautiful.” Flooring was still back rubber but it was given two sun visors, arm rests front and rear, assist straps. Seats carried foam rubber cushions, upholstered in artistically tailored vinyl, woven plastic or broadcloth in contrasting colours. 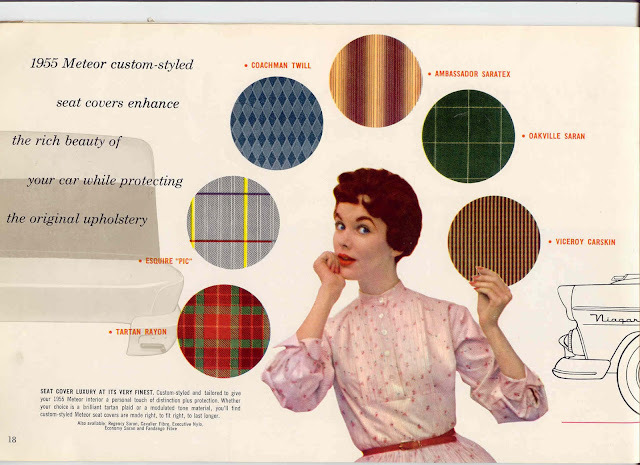 Inside a Rideau, prospective buyers were treated to luxurious High-Fashion broadcloth and vinyl upholsteries in exciting new colour combinations. To add to the pleasure, headlinings, door panels and other trim appointments were fashion-keyed. Sunliners and Crown Victorias were clad in all-vinyl. The latter had a folding centre armrest in the back seat. Only 114 Meteor Business Coupes were built in 1955. The least expensive in the lineup, the three-passenger coupe listed for $2,064. Meteor got ball-joint front suspension, larger brake drums, rode on the new tubeless tires. The frame was billed as being a new, Heavy Duty K-Bar Frame, engineered to accommodate each different Meteor body type. The most expensive model in Meteor’s 1955 stable was the Sunliner (rear) ringing up the cash register at $3,047. Exactly 201 of the posh ragtops were built. 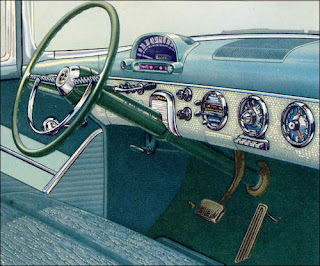 One could order a Six or eight-tube push-button radio and, a rear speaker promised to deliver “Three-dimensional Reception.” Also on the options list was turn signals (not required by law until January 1, 1956), a windshield washer for “Safety Clear” windshields, rear fender shields (Ford speak for fender skirts), Swift Sure Power Brakes, Master Guide Power Steering, Power-Lift Windows, Four-Way Power Seats and Sea-Tint Safety Glass. Then there was a stem-wind clock, full wheel covers, a heater, Door Top or Belt Line mounted rear view mirrors, undercoating, standard or deluxe antennae, Anti-Glare Shade, Back-up Lights, Bumper Guards, Bumper Guard Wing Kits, a Brake Light Signals, Compartment Lights, Curb Signals, Door Handle Shields, Door Edge Guards, Dual Exhaust System, Electric Clock, Engine Heater, Exhaust Deflectors, Floor Saver Mats, Frost Shields, DeLuxe Licence Plate Frames, Locking Gas Cap, Rear Window Defroster, Road Lamps, Portable or fixed Spotlight, Sprazon Beauty Treatment, DeLuxe Steering Wheel, Sun Visor, Tire Chains, Tissue Dispenser, Vanity Mirror, Wheel Trim Rings, Window Vent Shades and Wire Wheels as just a few of the items a well-dressed Meteor might wear. Despite the long strike, production added up 23,590 Meteors, giving Ford’s star seventh place in the domestic industry behind Chevrolet (79,308), Ford (56,326), Pontiac (40,516), Dodge (39,525), Plymouth (33,325) and Buick (23,762). Thanks to THIS blog, I was able to identify my father-in-law's car! It was a side view photo showing the driver's side, with the unique straight edge V or Z design... and a wee bit of a blurry last three letters of the name. I searched and searched and searched... and then recalled there was a Rideau car. Thanks to your efforts, I now know his old car was a 1955 Meteor Rideau Sunliner, with its unique three-toned colours on the door. I know this post is from six years ago, but, I just wanted to say thanks for your efforts. As a fellow blogger on obscure history (I do very early aviation, as well as one on Japan), I know there are writers who appreciate knowing their love affair is read and informative! Cheers! Oh yeah - it was one of the 201 convertibles!